With the holidays quickly approaching, this is actually a recipe that I’ve seen floating around in several different places. And naturally, since it’s floating around in several different places, there are several different recipes for it. I’ve seen different types of chocolate, different nuts, added coconut, all kinds of stuff. Well, I kept this batch really simple, and including things that I know my family would love. The original recipe I saw had twice the amount of ingredients, which makes a TON of these little guys. This is a smaller batch than the original recipe I saw, and it still made over 50 of them…and I made them about the size of a standard cookie. If you don’t have a crock pot, no need to worry! 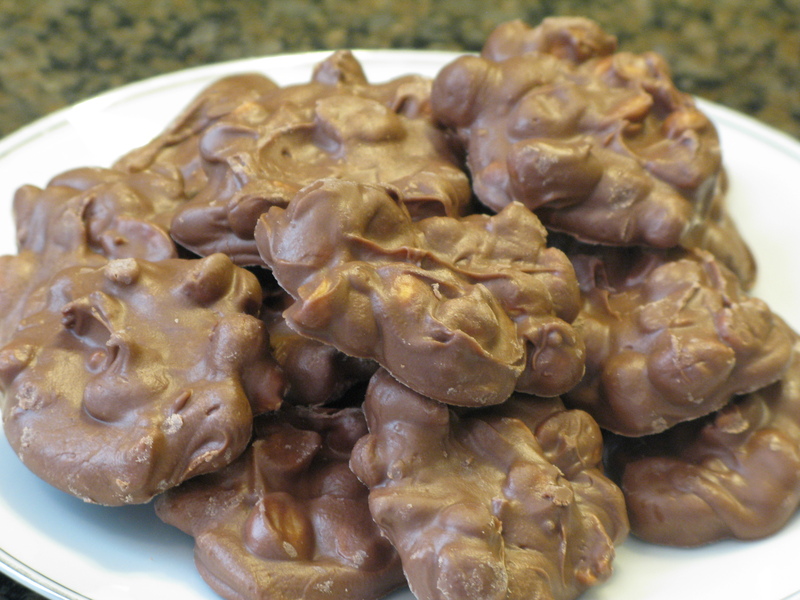 You can melt the chocolates in a large, microwaveable bowl in increments of 45 seconds, stirring in between each one until all of the chocolates are melted, then stir in the peanuts and distribute them to wax or parchment paper. Or, if you even prefer to melt your chocolate on the stove, you can do that as well on low heat, and proceed as usual. What was so easy about this recipe was being able to walk away from it, not having to stand by the whole time. So, whichever way you prefer to make it, go for it! Chop up almond bark, and combine all ingredients in crock pot on low. Cover and cook for one hour, stir mixture. Stir every 5-10 minutes after first hour until chocolate is melted and peanuts are coated. Spoon clusters on to wax or parchment paper to set. Store in airtight container at room temperature (these do not need to be refrigerated, and will actually cause them to have a whitish film if they are stored in the fridge).